New Delhi: A year after the Reserve Bank of India (RBI) and Union finance ministry pulled out all stops to combat the fallout of the global financial crisis, policy planners are struggling with the dilemma of the sequencing of the exit strategy from the policy measures, especially with respect to a loose monetary policy. The dilemma is most acute, point out some analysts, because, unlike in some of the other economies, the monetary and fiscal measures in India were staggered, making it very difficult for policy planners to ascertain as to what really worked and what didn’t. In addition, signs of incipient recovery together with an emerging threat of inflation could force policy action that could undermine factors which led to the recovery in the first place. RBI governor D. Subbarao flagged this dilemma in a speech in Istanbul on 5 October in the wake of increasing inflation and signs of economic recovery. “While there is broad agreement that we need to exit from the present excessively accommodative monetary and fiscal policies, there is less agreement on when and how we should exit." Expanding on the idea, Subbarao said, “An early exit on inflation concerns runs the risk of derailing fragile growth, while a delayed exit may engender inflation expectations." “When stimulus was provided, it was kind of ad hoc interventions. It was a sum of several stimuli packages," D.K. Srivastava, director of Madras School of Economics (MSE), who was a member of the 12th Finance Commission, said. “All of that has helped to revive demand," Srivastava said. Along with a positive spin-off on aggregate demand, the fiscal measures also added to the combined fiscal deficit of Union and state governments. The Union government announced a record borrowing programme of Rs4.51 trillion in the current fiscal to finance the deficit. It is expected to result in a fiscal deficit of Rs4 trillion in 2009-10, 6.8% of gross domestic product. A fiscal deficit of this magnitude cannot be sustained, C. Rangarajan, chairman of the Prime Minister’s economic advisory council, said at a seminar in New Delhi on Wednesday. “Fiscal policy will continue to remain accommodative till March (2010)," he added. Rangarajan’s comments came in the backdrop of two key developments. 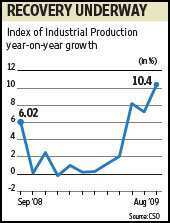 Factory output in August grew 10.4% year-on-year, a 22-month high. Headline inflation, or the Wholesale Price Index, which was negative a month ago, is expected by Rangarajan to rise to about 6% by end-March. For the week ended 3 October, the headline inflation was 0.92%. So far, the increase in inflation has been driven primarily by higher food prices, which curtails the scope for monetary policy actions such as interest rate hikes. “There are implications for inflation expectations," Subbarao said, explaining the central bank’s concern about a rise in inflation even if it was on account of food prices. In July, Subbarao in his monetary policy speech had said: “Monetary policy conduct will continue to condition and contain perception of inflation in the range of 4-4.5%." The challenge posed by inflationary expectations may result in monetary policy being used as the first line in the overall exit strategy from measures announced between October 2008 and February 2009 to combat the economic slowdown and frozen credit markets of last year. “We see monetary policy reversing earlier (than fiscal policy) as inflation expectations have remained elevated," Shubhada Rao, chief economist at Yes Bank Ltd, said. The sequence of exit from crisis-induced monetary policy measures to deal with a changing situation is likely to begin with a move to drain some liquidity. “Clearly, onus is on active liquidity management. If the strength in capital inflows continues, liquidity overhang is likely to get exacerbated, unless the burden is entirely borne by exchange rate, which has been in evidence in recent days, (rupee has appreciated by 4% during the month so far)," Rao said. Rangarajan, governor of RBI in the 1990s during the Asian financial crisis, said RBI might deal with the situation by whittling down its open market operations, which now support the government’s borrowing programme by ensuring adequate liquidity in the market. Economists felt RBI was unlikely to tinker with interest rates for the moment. “In my view, there will not be an aggressive tightening of monetary policy," MSE’s Srivastava said. Subbarao is scheduled to present the quarterly credit policy on 27 October.